Have you always looked for ways to create space in your home without making a complicated mess? Saving space is something I’m always on the look out to do. And if you’ve ever bought furniture from IKEA before, then this clever space-saving hack might be just the project you’re looking for. 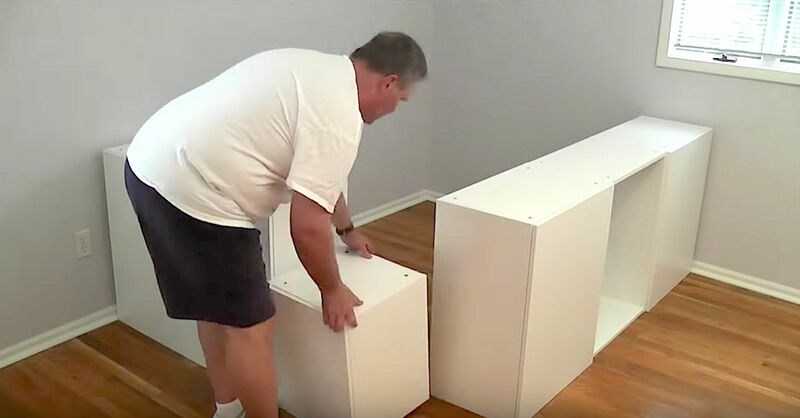 In this video, you’ll watch as YouTube user Chris Heider demonstrates to the audience how to take Ikea kitchen cabinets and transform them into a platform bed with storage cabinets. Chris states that this hack requires around 6 hours of labor and doesn’t cost more than $500. For someone like a college student who might be on a tight budget, this DIY project is just perfect. When I saw the end result, I couldn’t believe my eyes. Chris takes various pieces of IKEA furniture and carefully assembles something I would’ve never though possible. It goes to show you what can be done with a little bit of time and a whole lot of creativity. What did you think about this IKEA furniture hack? We want to hear your thoughts. Let us know in the comments below! Please SHARE this with your friends and family who love clever furniture hacks.